10 runs from Zuhaib's over with 1 six & a four by Anwar. A good start.. shabaaaaaa Karachi shabaaa..
Are you watching #KarachiKings match? لاہور قلندرز کے سپانسر' ال کرم ' کا پیغام ! 4 more. Good shot Malik. Gif alatuul sixer and fours. Means hit some continues six n fours. Minar e pakistan vs samundar. 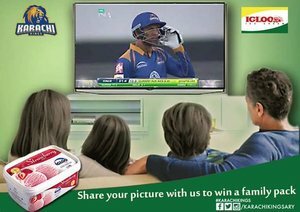 *.. Hope so It is going to be another nail biting match..
My support for one n only #KarachiKings ???????? تسی سارے ٹویٹر تے بزی ادھر قلندرز سے آوٹ ہی کوئی نہیں ہو رہا ???????????? Very poor fielding by @lahoreqalandars . They are playing street cricket.